ecGraph Demo13. 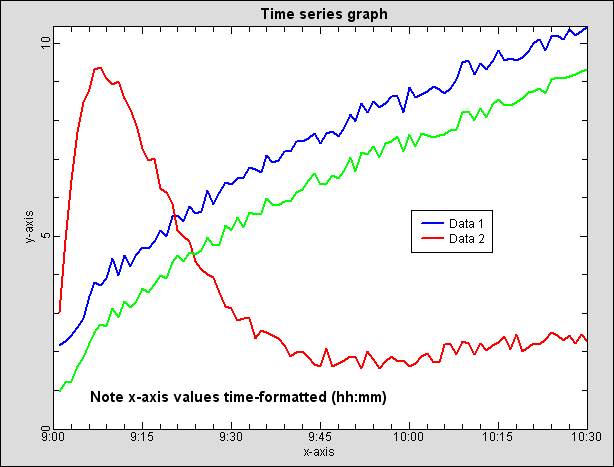 Time series graph, with axis values as "hh:mm"
Showing axes formatted as time using "hh:mm". 'portion is the date, and the fraction portion is the time as a fraction of 24 hours. 'Midnight is 0 and midday is 0.5; For dates, 0 is 30 Dec 1899. 'One hour is t=1/24. One minute is t=1/24/60. 'So t=5/24=0.2083333 is 5:00AM, and t=5/24+14/24/60=0.2180555 is 5:14AM. 'Start a new graph on the page..
'in you get the seconds display. 'When ScaleStyle<>3 and TextLabels$<>"", the format string will be used. Call .AxisScaleStyle(t0, t1, 6, 5, 1, "h:mm") 'could also use "hh:mm:ss"
'Start three new data sets on the graph.. Call .Refresh 'remove this line for "instant draw"
Call .Refresh 'Always end with "Refresh"